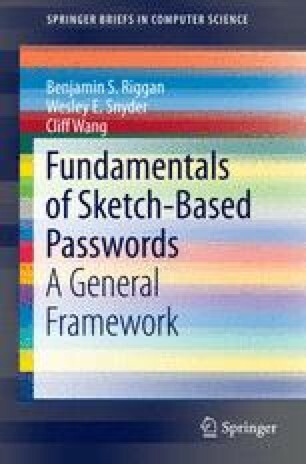 The most relevant work related to sketch-based authentication systems is discussed in this chapter. There are three primary areas of focus: terminology, graphical authentication systems, and biometric systems. All the terminology introduced not only occurs within this brief, but throughout the literature. These definitions are introduced first so that the likelihood of misinterpretation is minimal. Graphical authentication mechanisms may be based on global cognitive recognition, local regions of interest, or relatively simple drawings. This brief only focuses on the latter. Biometrics, which may conceivably be considered a completely independent topic, are thought to provide the best possible security. For all intents and purposes, graphical authentication and biometric security are completely separate problems. However, after understanding the intricate details for each problem, the recognition problem associated with graphical passwords fused with biometric information is more easily comprehensible. PASSFACES CORPORATION. The science behind passfaces. http://www.passfaces.com/published/The%20Science%20Behind%20Passfaces.pdf, 2009.